In the very best Broadway musicals and Hollywood blockbusters, there’s an absolute wow number to hook your audience from the start. Lin-Manuel Miranda, one of the Fosse/Verdon executive producers gets this, as does Hamilton director Thomas Kail, who helms this episode, and Dear Evan Hansen scribe Steven Levenson, who wrote it. So to pay homage to the royal Broadway partnership of Bob Fosse and Gwen Verdon, Fosse/Verdon gives us both Sweet Charity (specifically, the iconic “Big Spender) and Fosse’s professional peak Cabaret in the very first episode, as if daring the viewer not to be enthralled. It’s a near-impossible package to resist in an action-packed hour, even if it didn’t have so many other things going for it. Namely, the fascinating performances of the two chameleon-like leads. We’ve been aware of Sam Rockwell’s dancing skills since the days of Charlie’s Angels, but he inhabits the role of Fosse, the insecure, Fred Astaire-wannabe who instead became an Oscar-winning director and the most famous choreographer the world has ever known (think of a famous choreographer: whose name comes to mind?) Rockwell, no longer as underrated as he once was thanks to that Oscar for Three Billboards Outside Ebbing, Missouri, manages to make the role of the womanizing, pill-popping musical theatre genius even sympathetic, as we try to understand why this happily married man would threaten his family due to his need to find validation in other women. We are aided in that insight by flashbacks that show a young Bob dancing his heart out in front of a as-yet-unidentified stern, smoking taskmaster (who looks a lot like an uncredited Josh Brolin) who stresses to Bob that he’ll never be good enough. He could either be a player from Bob’s past (likely) but also the personification of Fosse’s eternal, ambitious, never-ending insecurity. So far Rockwell’s is the showier role, but Michelle Willam’s quiet strength as Gwen Verdon is straight-up astonishing. Like Rockwell, she possesses her character—even down to the way she blinks—as well as her low, timbre-filled voice. We’re immediately fascinated by Verdon’s motivations as well, how she puts her own career aside to help her husband’s, bringing so much to their creative partnership. Notably, the very first flashback scene we see of the two of them is Fosse working out choreography with Verdon as a model: He’s like a sculptor, but she’s the resulting creation who has her own ideas, which sometimes exceed his own. Fosse/Verdon’s major flaw is that it’s focusing too much on the former, not enough on the latter, as Gwen’s story is undoubtedly every bit as fascinating as her husband’s. Is she really that unaffected by the fact that her husband is directing someone else in the part she created? Where’s her flashback to childhood that shows what drives her? It’s Verdon, after all, who finally convinces producer Cy Feuer (why is Paul Reiser even considering that Mad About You revival when he’s obviously having so much fun in character roles like this one?) what in the hell Bob is trying to accomplish in Cabaret. The days of the candy-colored Hollywood musical were over, but Broadway vets and Hollywood execs like Feuer were slow to catch on. It’s why “Big Spender,” the number that opens this series, is one of Charity’s few high spots, as it grittily conveys that these woman are offering “fun, laughs, good times” while feeling anything but (contrast with Shirley MacLaine’s interminably giddy “I’m A Brass Band,” which goes on for six saccharine minutes). In Cabaret, Fosse is able to go deeper and darker than he did in Charity—which is what makes that film a success, while the falsely sunny Charity was not. Verdon gets this, and the connection between the two is so strong that only when he sends for her in Munich is he able to realize his true vision. Fosse/Verdon goes heavy on the creative license here—surely there were costume designers and makeup artists on set who also had some say in what Liza Minelli would be wearing and what her backup dancers would look like. But Verdon’s surety in her husband, and her self, offers a fascinating look behind the curtain, crafting backstories for even the smallest characters to help the actors reach their full potential, or treating dancers like figurines to be cut when they can’t fit into a frame. Gwen knows what Bob wants and is his conduit to help him get it. A throwaway Gwen line like, “That’s what Bob’s saying” speaks volumes, as she’s explaining his vision better than he himself can. It’s that partnership of Fosse/Verdon that is the true draw—all the things these two brought to each other. There’s a definite tinge of resentment on Bob’s side: Even in his delightful cocktail party story about getting caught in his wife’s dressing room and having to explain himself, he’s identified as “Mr. Verdon.” When Cy suggests that Bob try to sell himself as a package with Gwen, he says she’s busy, even though we know she isn’t. But when the chips are down—when he’s struggling with Cabaret in Munich—he calls Gwen, even with another woman in his bed. Fosse/Verdon employs an economy of movement and dialogue that both Fosse would have appreciated. It’s to the show’s credit that even in this initial outing, instead of fireworks, it relies on the smallest of moments to convey this relationship. Gwen knows just by where Bob’s hand is placed that he’s involved with someone else, and all she has to say is, “When I get back…” to nip that in the bud. He quickly replies “I promise.” How did these two people get so incredibly close, despite this relationship roadblock that will keep them (and eventually tear them) apart? 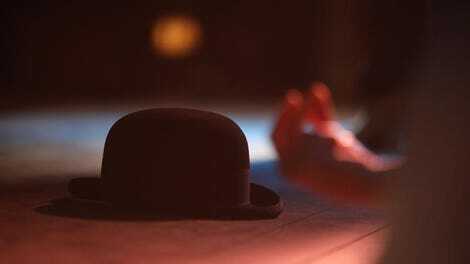 The drama bar raised in Fosse/Verdon’s first episode promises that this series will involve a fascinating exploration to find out. The final screen of “Eight Minutes Left” is also one that Fosse—a man so obsessed with his own mortality he made an entire movie about it—would likely applaud. In only a few minutes he’ll soon crumble in Gwen’s arms—which, by the end of Fosse/Verdon, will likely seem poetically appropriate. 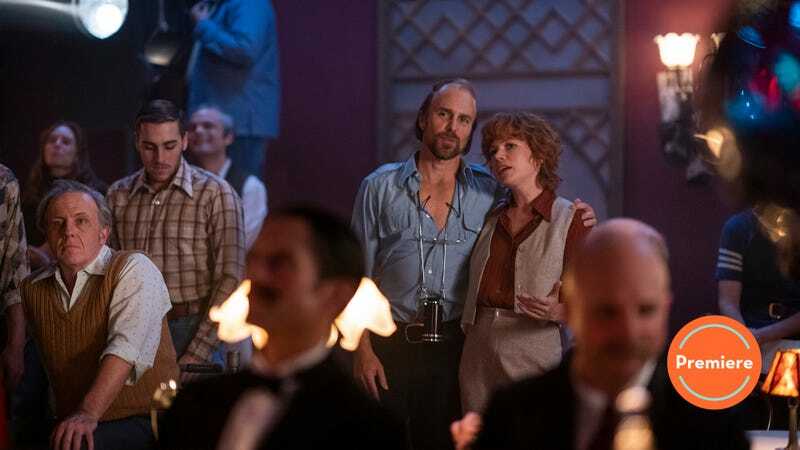 Welcome to weekly reviews of Fosse/Verdon, everyone! I am obviously thrilled to be here, and can’t wait to hear you thoughts on this riveting show. I have been listening to almost nothing but the Chicago soundtrack since my first viewing. This week’s featured member of the Fosse/Verdon inner circle: That’s You’re The Worst’s Aya Cash as Neil Simon’s first wife Joan, a necessary voice of reason who expresses frustration over Verdon losing the movie role of Sweet Charity, the part she personified on Broadway, as well as concern over what Bob might be up to in Munich. Joan was once a Martha Graham dancer herself, and Simon’s play Barefoot In The Park was based on the early days of their marriage. She died of cancer in 1971. Rando Fosse/Verdon-related factoid of the week: Joan and Neil Simon’s daughter Nancy, briefly mentioned as a playdate option for Nicole Fosse this episode, married Woody Harrelson. They were supposed to get an annulment the next day, but stayed married for 10 months. Do you remember that database a few years ago that showed how popular your name was over decades? Although my first name has swung upward as of late, probably because of Gwen Stefani, before that the highest “Gwen” surge was in the 1950s, likely because of Gwen Verdon. My few tenuous Fosse connections: I was a dance hall girl in the “Big Spender” scene at a small summer theater production in college, failing miserably. Fosse connection number two: I was once on an idyllic vacation in Mendocino, California, where there was a pub on the corner that was like the nucleus of the tiny downtown. The proprietor asked my friend and me where we were from, and when we said, “Chicago,” he said, “Oh, me too! In fact, they just named Lawrence Avenue after my brother up there.” Since I lived right by Lawrence Avenue and had seen the brown memorial street marker, I knew exactly who he was talking about. “Your brother is… Bob Fosse?” So if you’re ever in Mendocino, head to Patterson’s Pub and say hey to Don Fosse, everybody. He predicted I would also end up out there eventually, but Don, it hasn’t happened yet. Next week: “Who’s Got The Pain” fortunately offers us some more Gwen time, as we go back to When Gwen Met Bob.